Built in 1917 as a “club” for Cuban cigar makers and their families as their home away from home, it soon became the center of social and community life for the Cuban population in Key West. After the original Cuban Club burned down in 1983, it was restored and converted to luxurious and spacious suites. Escape the stress and cares of your daily life with a vacation to the wonderful Cuban Paradise! 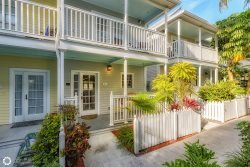 This roomy two bedroom condo has a private balcony to enjoy all the hustle and energy of the infamous Duval Street. The master bedroom sits in a loft overlooking the living room, and it features a four-post queen-sized bed, two nightstands with reading lamps, an alarm clock, private en suite bathroom, large closet, and a small electronic safe. Located downstairs is another bedroom with a queen-sized bed, a nightstand with reading lamp, large closet, and flat-screen TV. The expansive living room features two luxurious sofas, one of which folds into a sleeper sofa, a coffee table, glass kitchen table with six comfy chairs, and a flat-screen TV. If cooking is your passion, then you’ll love the fully-stocked kitchen, which includes a full-size refrigerator, dishwasher, stove, coffee maker, toaster, and microwave. You’ll want to take pictures at the Southernmost Point in the continental United States (only 3.5 blocks away), and fulfill all of your shopping desires at the dozens, if not hundreds, of shops and stores distributed along Duval St and adjoining streets. Walk to one of two shared pools a mere three blocks away! One block away is Banana Cafe, a fantastic French restaurant for breakfast with crepes, baguettes, and croissants. The sandy shores of South Beach are just three blocks away, with the Southernmost Cafe right there for lunch. The best sushi in town is served at Origami, also located one block away. It’s all there for you, so come and enjoy! Parking: One off-street spot reserved, with on-street parking also available. Sleeping Arrangements: 2 queen beds and 1 queen sleeper sofa. Pets: Pets are welcome; some restrictions may apply.